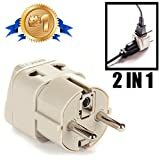 The electrical receptacles used in Germany are type F. You will therefore need a US to type C/F adapter in order to plug in your appliances. Special considerations - Type F ("Schuko", short for "Schutzkontakt") is standard. Type C Plugs are common, especially for low-power devices. 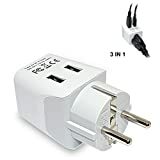 Type C wall sockets are very uncommon, and exist only in very old installations.